kzoNobel has entered into a partnership in China with Quangxi CAVA Titanium Industry for the production and supply of titanium dioxide (TiO2). The Chinese collaboration, which includes the construction of a new TiO2 plant in Qinzhou, will help to secure AkzoNobel's growing titanium dioxide raw material needs for the Asian market. Financial details were not disclosed. Rapid growth is expected within the global coatings and paints market and most of this demand growth will occur in Asia, especially China. As a result, the regional demand for TiO2 will also rise. Quangxi CAVA Titanium Industry was recently established to produce titanium dioxide and is currently in the process of designing and constructing a 100,000 tonnes/year TiO2 plant at an industrial site in Qinzhou. Production is expected to start in early 2014. Titanium dioxide is by far the most widely used white pigment in the industry because of its brightness and opacity. Approximately 5 million tonnes of TiO2 are consumed annually worldwide, mainly in the coatings, plastics and paper industries. 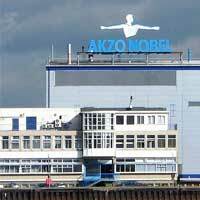 AkzoNobel is the largest global paints and coatings company and currently employs around 6,700 people in China, where revenue for 2010 totalled EUR1.3 billion. The majority of revenue is generated from local demand. The company has 27 manufacturing locations in China.